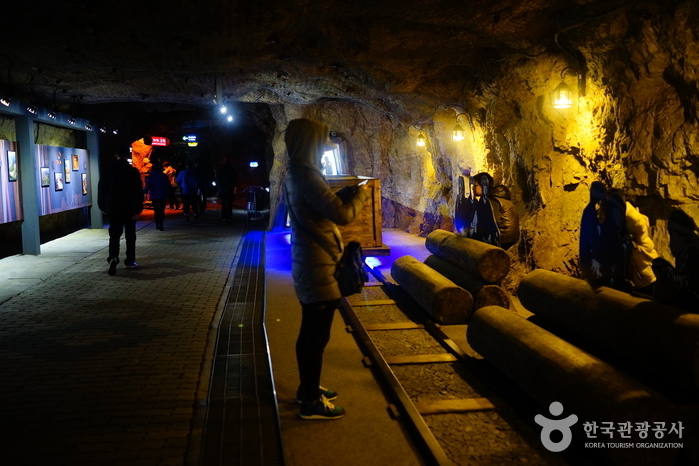 Hwaamdonggul Cave used to be a gold mine that was commercially operated from 1922 to 1945. The nation’s 5th largest gold mine was, however, found to have natural stalactites, and later the cave was developed as the only theme-based cave that combined gold and nature. The stalactite area is an open space of 2,800㎡ and the length of the path open to visitors is 1,803 meters. The entire area consists of 5 chapters, which in turn constitute 41 zones; it takes about an hour and a half to see all of the zones. You can travel to the entrance of Hwaamdonggul Cave on Korea’s first cave monorail listening to the soft piped-in music of Jeongseon Arirang. 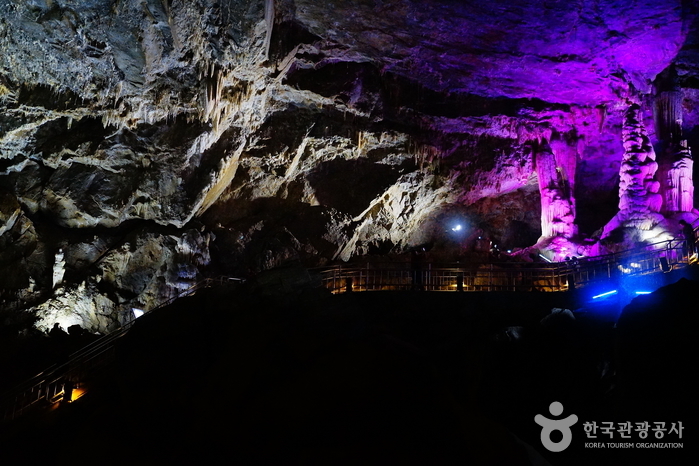 Hwaamdonggul Cave is not only a tourist attraction but also an educational venue where you can learn a lot about the subterranean ecology of a stalactite-lined cave and the process of gold mining/refining. Chapter 1. History: The processes used in the development of the Cheonpo Goldmine are demonstrated. Also, actual gold veins, excavating facilities and other mining traces have been preserved for tourists. Chapter 2. 365 Steps to Gold: The 90-meter high natural cave that connects the upper and lower shafts is now connected by 365 steps, and you can enjoy cave flowers and wall craters/holes while walking down the steps. Chapter 3. Golden Fantasy: The process of gold mining and the value of gold are explained by animated characters. Chapter 4. More About Gold: You can see an 18.5kg gold bar, educational videos, dioramas, and learn even more about gold. Chapter 5. Mysterious Mother Nature: The natural stalactite cave offers unembellished yet magnificent scenery with Asia’s largest stalactite cascade, huge stalagmites/stone pillars, a statue of the Virgin Mary, a statue of the Buddha, cave flowers and helictites.